Looking at the column I am watching in the picture, you will say: « I see a Pharaoh offering a branch of flowers and three geese or ducks to a god... it's nice... » and after having admired you will go your way... and it would be wrong…. Because in fact,you will miss the richness of meanings that an ancient Egyptian would have understood, him, seeing such a scene…. 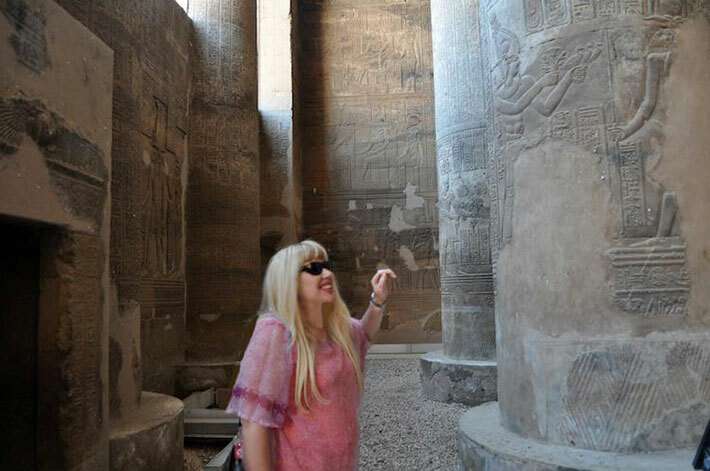 First of all, we are in the temple of Esna, which is dedicated to Khnum. And Pharaoh is making his offerings to Khnum on the right . Khnum is the image of the third aspect of Ra. He is the god of rebirth, creation and the evening sun. In Esna (Letopolis), known as Iunyt or Ta-senet, to the Ancient Egyptians, in this temple, Khnum is referred as « the father of the fathers »….Because Khnum at the origin is the divine representation of the source of the Nile River. Khnum is linked to the annual flooding bringing the silt and clay, giving life and richness to the fields..for that he was thought to be the creator of the human bodies, which he made from clay at a potter’s Wheel and then placed in their mother’s wombs. Khnum the ram : the total symbol of fertility. In order this fertility does not cease to return to Egypt, Pharaoh his making symbolic offerings to Khnum. The depiction of the 3 birds, or egyptian geese or ducks of the same family is not a representation per se of 3 geese, because the number 3 is meaning in ancient egyptian writing: the plural, the myriads. So Pharaoh is offering a myriad of birds. And to the ancient egyptians the millions of these migratory birds from Eurasia that filled the Egyptian skies each autumn coincided with the rising of the Nile waters and the flooding of the fields for the prosperity. To the ancient Egyptians, the arrival of these migrants reaffirmed their belief in the cyclic rebirth of the universe and transformed birds into powerful symbols of life and protection. Regarding the branch of flowers : the first thing you have to know is that in ancient egyptian the branch : « Teru » means :to invoke, to pray, to adore….and Pharaoh with these lotus in his hands is holding in reality the symbol of water (lotus) that is greatly needed, so Pharaoh is invoking Khnum for very needed water and flood … The lotus was the only flowering plant in Egypt that bloomed continuously throughout the year and the egyptian lotus is a unique flower with respects to the fact that it is the only flower that fruits and flowers simultaneously. It was also associated with rebirth and creation. This was because the lotus flower is closing during the night time and descending back into swampy water and rising up once again at dawn. In Egyptian religious thought the lotus had associations with the etheric elements of water and of fire. The plant generated within water, but unfolded daily at the dawning of the sun.